And of course, I have more than enough gear, omegas, zetas, credits...for them because I know how to play as a FTP. Not being rude, but do you plan to do this for every new character released? Why not? This is the optimal way to play in light of GA matchmaking. This takes you up to three not-so-humble brag posts for the last three events/character releases. We get it, you're (apparently) a FTP gamer that loves hoarding stuff. Congratulations to the OP for showing a level of restraint I have never been able to attain! I'm 100% f2p and have been dominating GA.
Lol, I couldn’t care less about GA, merely deploy, barely play; all raids only tag by “0” damage. I merely save all limited resources for the future best new releases, up to a month, usually save up for next month until I see what happens next. It’s my way of playing, as a FTP, I think it’s the best way to play. I love how your poggle (arguably the worst character of the bunch) is 7* and g10. That lvl 79 asajj is a clear sign of too much hoarding imo. 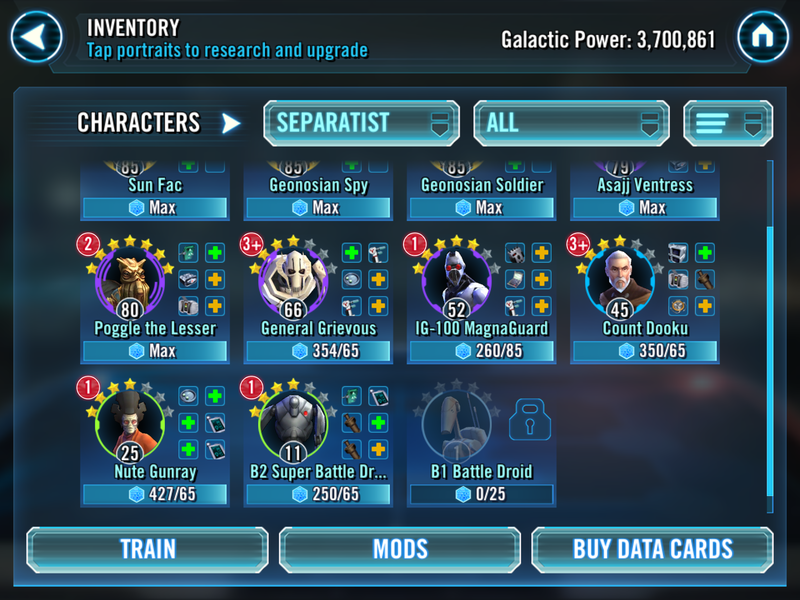 I'd love to view your entire roster to see what you've been up to during your swgoh carreer. Having boat loads of resources means diddly squat if you've got a bad roster. Hoarding needs to have a purpose, otherwise it's just wasted potential. If you want to give us an insight into your account so we can judge for ourselves, you can share your allycode or swgoh.gg profile. I for one love to know if you're actually a super effective f2p player, or just some noob who hoards alot. His profile has been asked for many times, he's not going to entertain you. Just leave him and his not so humble brags alone. Didn't you post about this before? Every once in a while you brag about having gear and -claim- you are F2P, but many do not believe you. I believe you have something odd about you, given how often you aggressively post about this. Something is up, getting weird vibes here. You have 104 additional GG shards. The only place he drops from is GW. I've seen it maybe 10 times over three accounts and roughly 1800 GW clears. There's another explanation. Nobody expects one seeing that you're an opaque attention seeker whose only interest is acting like a peac0ck. Correction: He also comes from the Ground War event. So...maybe...But still, make some productive comments and don't just troll everyone with how little you care about doing anything in the game. i believe GG also drops in that separatist event (i'm bad with names). I have 82 extra shards of GG. You are off the mark here (though not on your last sentence). What? Do you think I am the OP? The similarities are there. Lowkey bragging about not starring up characters and having 82 additional shards. Dude, I haven’t even told you how many stun guns I have!! but would you post your .gg profile ?! I actually wouldn’t because I don’t have one. I rest my case, haha. No no, I demand a rebuttal! What about the fact that I have started zero threads on this subject to the OP’s 3? I believe @Liath was just correctly pointing out that I was wrong and it is entirely possible to have a high number of excess GG shards for long term players. Prior to the last shop rework, GG was the only interesting toon in the shard shop and you couldn't use that currency for gear, so there would be no reason NOT to max him. There have been between 15 and 20 Ground War events, each with three chances at 5 GG shards. I was just wrong in my initial post. I think this is what you were looking for. Do you have an electric fan turned on for your ego? Lol, you obviously spend too much time in the forum according to your number of posts. All I can say is that I am in a top 50 guild and I have relatively low GP in my guild, I only do 600 tickets and participate in some events, don’t want to spend one more second on this game or the forum. Most people are pessimistic because they spend whatever gear, Omega and Zetas they have. Then, when new op characters are released, they couldn’t get the required characters ready to participate in the events or they couldn’t g12 the new op releases. They can’t help themselves like you didn’t.